Birch S., Casamian-Sorrosal D., Fonfara S., Chanoit G., Warren-Smith C. Unilateral absence of the right pulmonary artery with associated aortopulmonary collaterals and bullous lung lesions in a dog // J Vet Cardiol. 2016 Dec;18(4):405-412. This case report describes a combination of congenital cardiopulmonary abnormalities found in a 1-year-old Labrador Retriever. To the authors' knowledge this combination of cardiopulmonary abnormalities has not been previously reported in veterinary medicine. Unilateralabsence of the right pulmonary artery associated with unilateral right-sided aortopulmonary collaterals was observed. These aortopulmonarycollaterals preserved the blood supply to the right lung lobes but led to left ventricular volume overload. There was also evidence of severe bullous lung disease in the right lung, which was suspected to be secondary to pulmonary sequestration as a result of the anomalous hemi-pulmonary circulation. The diagnosis of left-sided volume overload was achieved by radiography and echocardiography while the remainder of the findings was diagnosed on computed tomography angiography. The owner refused surgery for occlusion of the shunting vessels and therapy at standard doses of benazepril, spironolactone and pimobendan was initiated. In spite of the severe volume overload, the dogremained stable with static non-progressive clinical signs and stable echocardiographic findings at 1-year follow-up. The case report also acts as a reminder of the possible occurrence of unusual extra-cardiac shunts in the presence of an unexplained left ventricular volume overload. A 1-year-old 36 kg entire male Labrador Retriever was presented with a 4-month history of exercise intolerance. The dog tolerated lead walking but short bursts of activity resulted in marked tachypnoea and dyspnoea. There had not been improvement of these clinical signs following trial therapy by the referring veterinary surgeon with fenbendazole, cephalexin, furosemide and pimobendan. On physical examination, the dog was in good body condition (score 3/5) and had a grade II/VI left-sided basilar systolic heart murmur. Pulmonary auscultation was unremarkable and the respiration rate was 30 breaths per minute . Haematology and serum biochemistry were unremarkable and troponin I levels were within the normal reference range. Systolic blood pressure was measured at 142—164 mmHg using an indirect oscillometric technique (diastolic pressure was not recorded). Arterial blood gas analysis revealed an oxygen saturation of 96% at room air. Radiographs of the thorax were acquired under general anaesthesia by the referring veterinary practice prior to referral. These showed marked and predominantly left-sided cardiomegaly with displacement of the terminal trachea dorsally (Fig. 1). A hypervascular pattern was observed throughout the lungs particularly on the right side, resulting from dilation of both the pulmonary arterial and venous vasculature. Additionally, there appeared to be an ill-defined linear soft tissue opacity lateral to the right caudal lobar bronchus in the expected location of the right caudal lobar pulmonary artery. This opacity was narrow and irregular when compared with the more substantial pulmonary artery supplying the left caudal lung lobe. On echocardiographic examination the left ventricle and atrium appeared severely enlarged with adequate left ventricular systolic function. Left atrial diameter on right-sided parasternal 4- chamber long axis view at end-systole measured 58 mm and left ventricular internal diameter from M mode measurements from a right-sided parasternal 4-chamber short axis view was 68 mm (normal 39.8 ± 5.1 mm ; or 36 to 53 ) and 48 mm (normal 28.2 ± 2.6 mm1; or 22 to 39 mm ) in diastole and systole, respectively. Left atrium to proximal aorta ratio measured in a right-sided parasternal short axis view was 2.06 (normal < 1.6) . Systolic function was consid¬ered adequate (fractional shortening 29%, normal 28% ± 7.1 ; ejection fraction 55%, normal 54% ± 11 ). There was mild mitral regurgitation (centrally orientated jet) with a normal valve appearance, which was suspected to be secondary to annular dilation. The aortic, pulmonic and tricuspid valves were normal in appearance and showed no evidence of incompetence. The right ventricle and left and right ventricular outflow tracts were also unremarkable. The pulmonary artery could only be imaged up to the suspected point of the bifurcation and was normal in size and appearance. Other than mild mitral regurgitation there was no evidence of abnormal flow on colour and spectral Doppler studies within the heart, left and right ventricular outflow tract, proximal aorta or pulmonary artery. Aortic velocity was mildly increased (2.7 ms; normal considered at <1.8 m/s ). Pulmonic velocity was normal (0.9 m/s; normal <1.0 m/s ). There were no obvious abnormalities on transmitral flow assessment (E wave 0.9 m/s; normal <0.9 m/s [1,4]; A wave 0.6 m/s; normal <0.7 m/s [1,4]; isovolumic relaxation time 67 ms; normal 40—75 ms ). Since neither tricuspid nor pulmonic regurgitation was present, peak regurgitant velocities could not be obtained however there was no evidence of pulmonary artery or right ventricular remodelling or abnormal pulmonary flow profile on spectral Doppler to support the presence of pulmonary hypertension. The echocardiographic findings were consistent with left-sided volume overload. The cardiac silhouette appears enlarged and has displaced the trachea dorsally. Apparent mediastinal shift of the heart to the left hemi-thorax was due to positional atelectasis of the left lung. A vascular pattern is present throughout the lungs due to dilation of both the pulmo¬nary arterial and venous vasculature. R, right, L, left. There was no evidence of an intra-cardiac left-to-right shunting, a patent ductus arteriosus, aorticopulmonary communications or other shunting vessel observed on echocardiography to explain the left-sided volume overload. A bubble study using intravenous agitated saline bubbles was unremarkable with bubbles filling the right side of the heart and absence of bubbles in the left side of the heart or abdominal aorta. The dog was not an athletic dog and there was not obvious systemic cause (e.g. chronic anaemia) to explain a general increased in total plasma volume. At this point an extra-cardiac left-to-right shunt was considered. A six-lead electrocardiographic examination was unremark¬able showing sinus rhythm with a heart rate of 88 complexes per minute. Computed tomography (CT) angiography was performed under anaesthesia to determine whether an extra-cardiac shunt was present. The thorax and abdomen were imaged using a 16-slice helical scanner.a Relative dextro and levo phases of the thorax were acquired using bolus-tracking software triggered by contrast within the right ventricle. During the initial dextrophase, contrast was visible within a normal right-sided cranial vena cava, right atrium and right ventricle. Following this, contrast was observed filling the left pulmonary artery and subsequently the left pulmonary lobar arteries. Contrast was also present within the left pulmonary veins returning blood to the left atrium. The right pulmonary artery could not be identified and whilst contrast was clearly visible entering the left lung via branches of the left pulmonary artery, there was no evidence of any contrast within the right lung at this stage (Fig. 2). Furthermore, a plexus of small, faintly enhanced tortuous vessels was visible within the cranial mediastinum between the cranial vena cava ven¬trally and the trachea dorsally. At the level of the sixth thoracic vertebra, these vessels became peri- oesophageal and continued caudally along the intra-thoracic oesophagus and closely following the main lobar bronchi along their course into the hilar region of the right middle, right caudal and accessory lung lobes. Tracking of these small ves¬sels along the right caudal lobar bronchus explained the apparent presence of a right caudal lobar pulmonary artery on radiography. During the levophase, contrast was clearly visi¬ble within the left chambers of the heart and aorta. The abnormal faint plexus of vessels observed during the dextrophase now enhanced markedly (Fig. 2) and at the level of the sixth to ninth thoracic vertebrae, three larger, 4—5 mm diameter vessels were identified branching sequentially from the aorta in a lateral direction and feeding into the plexus of anomalous media¬stinal vessels (Fig. 3). The diameter of the aorta reduced significantly from 17 to 12 mm caudal to the origin of these aberrant vessels, presumably due to shunting of a significant volume of blood away from the aorta. The tortuous plexus of ves¬sels followed the main bronchi to the right middle, caudal and accessory lobes and appeared con¬fluent with the right pulmonary vascular system (Fig. 4). The right-sided pulmonary veins exhibited marked contrast enhancement during the levo- phase consistent with arterial blood supply from the aorta. Within the abdomen an oesophageal branch of the left gastric artery appeared to communicate with the plexus of vessels around the oesophagus. The remainder of the abdomen was unremarkable. a Siemens™ Somatom Emotion™, Erlanger, Deutschland. Figure 2 A (quad): Computed tomography (CT) angiography of the thorax at the level of the ninth thoracic vertebra, transverse view. During the dextrophase, contrast is visible within the pulmonary arteries of the left lung (*) but there is no evidence of contrast entering the right lung. LV, left ventricle. B (quad): Volume-rendered dorsal plane 3-dimensional images produced from images acquired during the dextrophase of the CT scan, showing the right ven¬tricular outflow tract and pulmonary venous return from both left and right lungs to the left atrium. The aorta has been removed for clarity from the aortic arch to the level where the thoracic does not overlap with the heart. It is notable that only a normal left pulmonary artery is present and no right pulmonary artery is visible. CrVC, cranial vena cava; LA, left atrium; LPA, left pulmonary artery; RA, right atrium; 1 indicates left cranial (cranial part) lobe pulmonary vein, 2 indicates left cranial (caudal part) lobe pulmonary vein, 3 indicates left caudal lobe pulmonary vein, 4 indicates right caudal lobe pulmonary vein. PA, pulmonary artery; PV, pulmonary vein. C (quad): Computed Tomography angiography of the thorax at the level of the second thoracic vertebra, transverse view during the levophase. A plexus of small tortuous vessels (arrow) are markedly enhanced by contrast in the cranial mediastinum, seen here dorsal to the cranial vena cava and ventral to the trachea. These vessels were faintly visible during the dextrophase of image acquisition. Ao, aorta; CrVC, cranial vena cava; Oes, oesophagus. D (quad): Computed Tomography angiography of the thorax at the level of the third thoracic vertebra, transverse view. Numerous bullae- like structures are visible throughout the entire right lung lobe. T, trachea. Figure 3 A: Computed tomography angiography of the thorax at the level of the aorta, dorsal view. Three relatively large diameter vessels (*), believed to repre¬sent aortopulmonary collaterals, are visible branching from the descending aorta. The plexus of small, tortuous vessels described in the text (arrow), is also visible medial to the right lung. Ao, descending aorta. B: Computed Tomography angiography of the thorax at the level of the eighth thoracic vertebra, transverse view. One of the three aortopulmonary collateral vessels is visible branching to the right from the lateral aspect of the aorta (*). The plexus of vessels is visible within the mediastinum and can be followed along the bronchi into the right caudal and accessory lung lobes (arrow). Ao, aorta; LV, left ventricle; LPV, left pulmonary vein; RPV, right pulmonary vein. 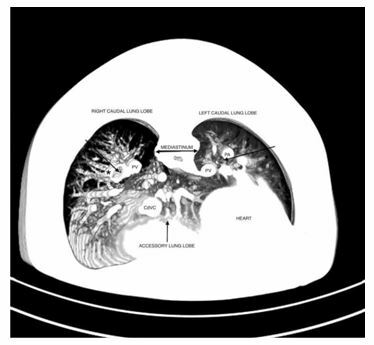 An additional finding was the presence of multi¬ple (>50) variably-sized spherical hypoattenuating structures throughout all lobes of the right lung with the larger structures having well defined thin soft tissue attenuating walls (Fig. 2). They were irregular in outline and in many cases did not appear to originate from or communicate with the bronchi. No such bullae were present in the left lung. In summary, these findings were consistent with unilateral absence of the right main pulmonary artery (UAPA) with secondary multiple aortopulmonary collateral blood vessels and numerous bullous lung lesions affecting the right lung. Surgical ligation or endovascular attenuation of the aberrant vessels was advised in order to reduce the left-sided volume overload. However, the owner opted for oral medical therapy and benazepril (0.5 mg/kg once daily), spironolactone (2 mg/kg once daily) and pimobendan (0.3 mg/kg twice daily) were started. At follow-up examination 1-year after diagnosis, the dog was stable with no evidence of progression of the clinical signs or changes on echocardiography. 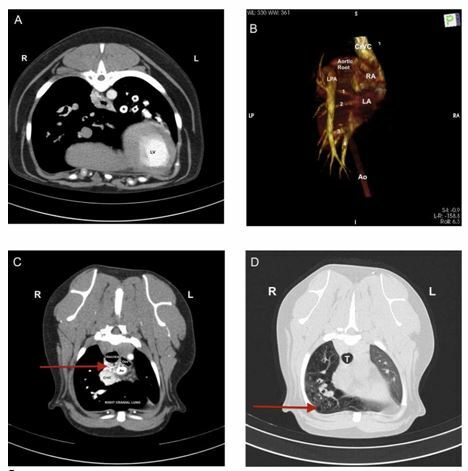 We report for the first time a case of a dog with unilateral absence of the pulmonary (UAPA) associated with multiple aortopulmonary collateral vessels and severe bullous lung disease. In humans, unilateral absence of the pulmonary is a rare congenital abnormality that presents either as an anomaly in isolation or more commonly in association with other congenital heart defects, particularly tetralogy of Fallot, atrial septal defect or ventricular septal defect [5,6]. Isolated unilateral absence of the pulmonary in people is twice as common in the right pulmonary artery than in the left . Failure of normal development of the pulmonary artery is believed to be caused by the inappropriate involution of the proximal sixth aortic arch and persistence of the connection of the intrapulmonary pulmonary artery to the distal sixth aortic arch . Complete absence of the main pulmonary artery including both pulmonary branches has previously been reported in a 2-year-old cross-breed dog with a ventricular septal defect  and in a 7- week-old Wire Fox Terrier puppy with an intact ventricular septum . Figure 4 Maximum intensity projection image of the thorax at the level of the caudal thorax, transverse view. Both left and right caudal bronchi are pointed at by arrows. Enhancing vessels are present on either side of the right bronchus. The medial vessel represents a pulmonary vein. The vessel on the lateral aspect on the right side (*), which communicates with the abnormal plexus of vessels described earlier, is in the expected position of the pulmonary artery. Thus, it is possible that this may represent the small part of the pulmonary arterial supply to the right lung. CdVC, caudal vena cava; PA, left pulmonary artery; PV, pulmonary vein. Collateral blood supply to the right lung arriving from the descending aorta was observed in the present case. Involvement of hypertrophied bron- choesophageal and bronchial arteries as part of the aortopulmonary collateral vessels, also known as major aortopulmonary collateral arteries (MAPCAs) [9,10], was considered likely and was supported by the existence of the plexus of small tortuous peri-oesophageal vessels that enhanced markedly during the levophase on the CT images. In humans collateral blood supply may also arise from MAPCAs from the descending aorta. However other sources such as ductal flow, bronchial, sub¬clavian or coronary arteries are also reported [5,6,11]. MAPCAs are intersegmental arteries that normally develop transiently in the primitive foe¬tus to supply blood to the lungs . MAPCAs along with nutritive bronchial vessels arise from the same splanchnic endothelial plexus in the embryo . They usually originate from the descending aorta and undergo involution once normal pulmo¬nary arteries develop . However, in certain cardiac diseases where a normal pulmonary arte¬rial flow supply to the lungs does not develop, MAPCAs may not undergo normal involution. MAP- CAs usually enter the lung via the hilar region and communicate with native pulmonary arteries either at the lobar or sub-segmental level or in the mediastinum and may also accompany bronchi as seen in this case . Enhancement of a vessel located on the lateral aspect of the terminal por¬tion of each lobar bronchus to the right lung lobes suggests that the possible presence of a residual portion of the terminal pulmonary arterial system which, in this case, may have connected with small pulmonary arteries. Without a post mortem how¬ever, this cannot be confirmed based on imaging findings alone. In the present case, the term 'arteriovenous’ fistulae was not used and could be misleading since the communication appears to be between the systemic and pulmonary arterial systems. A more accurate term that has previously been used to define any connection between aorta and pulmonary vasculature irrespective of the insertion is aortopulmonary collaterals . In the present case connection of the collaterals to some of the pulmonary veins was also suspected. An association between the unilateral absence of the right pulmonary artery and bullous lung disease has previously been reported in humans  and isolated congenital bullous emphysema, has also been reported in dogs . In the case presented here, the most likely cause of the lung bullae is intralobar sequestration. This process can present as localised emphysema or air-trapping  and rep¬resents a region of non-functional lung tissue that is supplied by systemic arterial blood and does not have a normal continuity with the tracheobronchial tree [15,16]. Indeed, the failure of development of the pulmonary arterial supply to a focal area of lung leading to the persistence of thoracic branches of the aorta has been proposed as a possible cause of intra-lobarsequestration .These aortic branches are frequently present in normal individuals with no evidence of cardiac or pulmonary anomalies but are believed to hypertrophy markedly in response to failure ofthe pulmonary arterial supply to lung tissue . It has also been speculated that the develop¬ment of cystic changes may be due to the high pressure of the systemic arterial blood supply compared with the more typical low-pressure pulmonary arterial system . In most cases, venous drainage of the sequestrum occurs through normal pulmonary veins into the left atrium . The clinical signs of exercise intolerance on presentation were thought to be due to the inability of the cardiopulmonary function to meet skeletal muscle oxygenation and demands during exercise. The apparent absence of a right pulmo¬nary arterial tree suggested that oxygenation of venous blood occurred exclusively within the left lung with minimal effective right-sided pulmonary function. The main presenting clinical findings in humans with UAPA and MAPCA are exercise intol¬erance, haemoptysis or pulmonary infections, or those specifically associated with the onset of congestive heart failure or pulmonary hypertension . Only exercise intolerance was observed in the case presented here. There is no consensus regarding the treatment for unilateral absence of the pulmonary and associated MAPCA in humans . In general, the therapeutic approach for unilateral absence of the pulmonary is based on symptoms of the patient, anatomy of the pul¬monary artery, associated cardiovascular anomalies and aortopulmonary collaterals and pulmonary hypertension . Asymptomatic patients diagnosed later in life and without evidence of cardiopulmo¬nary dysfunction are usually monitored . Depending on the clinical signs and the combina¬tion of findings, treatment options for symptomatic patients include partial or total pneumonectomy, closure of selected collateral arteries, or primary or staged pulmonary artery anastomosis . If the intrapulmonary arteries are well developed a direct primary anastomosis (or reconstruction with a tube graft) with the central pulmonary artery can be made . This anastomosis should however be made as early as possible in life as delayed interventions have a less favourable outcome . After careful evaluation with the input of human cardiac surgeons, anastomosis of the intrapulmonary arteries to the central pulmonary artery did not seem feasible in the dog presented here. Considering the young age of the dog and the severe volume overload, surgical ligation of the three main feeding vessels was advised. However, the owner did not wish to pursue surgical treatment on account of the potential risks involved, the adequate quality of life of the dog as perceived by the owner, and the uncertainty over the timescale of progression of the clinical signs. Indeed, 1 year following initial diagnosis the dog is stable with no evidence of progression of the clinical signs and with the absence of further cardiac remodelling or worsening systolic function on echocardiography. 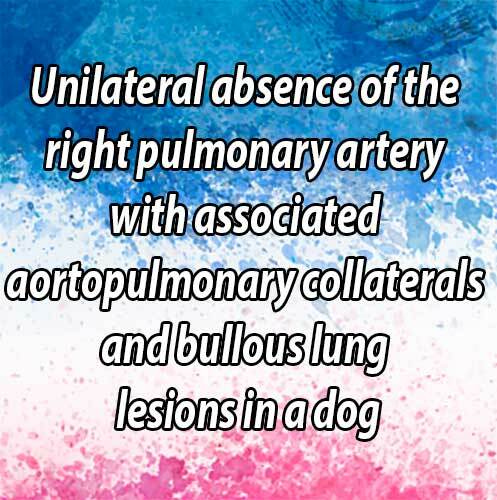 In conclusion, we report for first time a case of unilateral absence of the pulmonary artery in a dog including the suspected anatomopathological consequences of aortopulmonary collaterals with left-sided volume overload and bullous lung lesions and the associated clinical findings. Carnabuci C, Hanas S, Ljungvall I, Tidholm A, Bussadori C, Haggstrom J, Hoglund K. Assesment of cardiac function using global and regional endomyocardial and epi- myocardial peak systolic strain and strain rate in healthy Labrador Retriever dogs. Res Vet Sci 2003;8:241-8. Cornell CC, Kittleson MD, Torre PD, Haggstrom J, Lombard CW, Pedersen HD, Vollmar A, Wey A. Allometric scaling of M-Mode Cardiac Measurements in Normal adult dogs. J Vet Intern Med 2004;18:311-21. Rishniw M, Erb NH. Evaluation of four 2-dimensional echocardiographic methods of assessing left atrial size in dogs. J Vet Intern Med 2000;14:429-35. Schober KE, Fuentes VL. Effects of age, body weight and heart rate on transmitral and pulmonary venous flow in clinically normal dogs. Am J Vet Res 2001;62:1447-54. Kruzliak P, Syamasudar RP, Novak M, Pechanova O, Kovacova G. Unilateral absence of pulmonary artery: pathophysiology, symptoms, diagnosis and current treat¬ment. Arch Cardiovasc Dis 2013;106:448-54. Ten Harkel AD, Blom NA, Ottenkamp J. 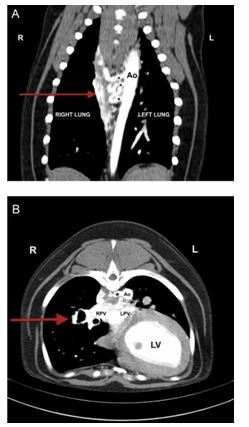 Isolated absence of a pulmonary artery: a case report and review of the literature. Chest 2002;122:1471-7. Tou SP, Keene BW, Barker PCA. Pulmonary atresia and ventricular septal defect with aortopulmonary collat¬erals in an adult dog. J Veterinary Cardiol 2011;13: 271 -5. Brown DJ, Patterson DF. Pulmonary atresia with intact ventricular septum and agenesis of the ductus arteriosus in a pup. J Am Vet Med Assoc 1989;195:229-34. Diethelm E, Soto B, Nath PH, Bargeron LM, Kirklin JK. 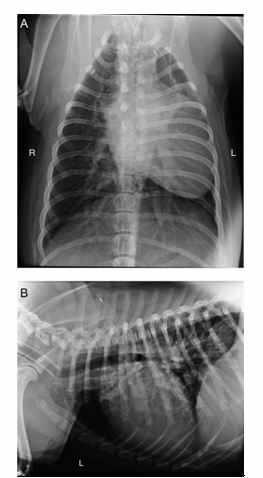 The pulmonary vascularity in patients with pulmonary atresia and ventricular septal defect. Radiographics 1985;5: 243-4. Rajeshkannan R, Moorthy S, Sreekumar KP, Ramachandran PV, Kumar RK, Remadevi KS. Role of 64- MDCT in evaluation of pulmonary atresia with ventricular septal defect. Am J Roentgenol 2010;194:110-8. DeRuiter MC, Gittenbergerde Groot C, Poelmann RE, VanIperen L, MentinkMMT. Development of the pharyngeal arch system related to the pulmonary and bronchial vessels in the avian embryo with a concept on systemic pulmonary Collateral artery formation. Circulation 1993; 87:1306-19. Betigeri VM, Betgeri AV, Saichandran BV, SubbaRao KSVK. Bullous lung disease and bronchiectasis in unilateral absent right pulmonary artery. Gen Thorac Cardiovasc Surg 2013;61:100-3. Tennant BJ, Haywood S. Congenital bullous emphysema in a dog: a case report. J Sm Anim Pract 1987;28:109-16. Ikezoe J,	Murayama S, Godwin JD, Done SL, Verschakelen JA. Bronchopulmonary sequestration: CT assessment. Radiology 1990;176:375-9. Prasad R, Garg R, Verma SK. Intra-lobar sequestration of lung. Lung India 2009;26:159-61. Frazier AA, Rosado de Christenson ML, Stocker JT, Templeton PA. Intralobar sequestration: radiologicpathologic correlation. Radiographics 1997;17:725-45. Smith RA. A theory of the origin of intra-lobar sequestration of lung. Surg Gyneco Obstet 1978;147:609-16. Stocker JT, Malczak HT. A study of pulmonary arteries: relationship to intralobar pulmonary sequestration. Chest 1984;86:611-5. Stocker JT. Sequestrations of the lung. Semin Diagn Pathol 1986;3:106-21.